WASHINGTON (Reuters) - The United States needs billions of dollars of new equipment including ice-breaking ships, better satellite service and fiber-optic networks as it prepares for climate change and melting ice in the Arctic, a top U.S. official said on Tuesday. 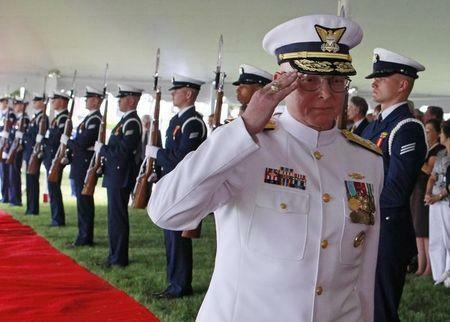 The total cost will not be clear until the U.S. government inventories its investment needs, former Coast Guard Commandant Admiral Robert Papp, who became the first U.S. special representative for the Arctic Region in July, told Reuters in an interview on Tuesday. Papp said the United States should also explore other possible models for funding, including asking companies that want to mine minerals and oil in the Arctic contribute to the infrastructure needed to ensure their safety. "We haven't put a lot of resources into taking care of the basics of maritime transportation through the waters of the Arctic," Papp said, adding that he hoped U.S. leadership of the eight-nation Arctic Council from 2015 would attract attention to the challenges created by the shrinking of the Arctic ice cap. The Arctic is drawing interest from energy, mining, shipping and other companies keen to benefit from development of a new frontier, although the austere climate and brief season for human activity will likely keep those efforts at a slower pace. "At some point in time, particularly if there is year-round activity, you're going to have to invest in the resources," said Papp, who has been pressing U.S. lawmakers for years to fund a new heavy ice-breaking ship valued at about $1 billion. Budget pressures have slowed investment in new programs, particularly since the U.S. military does not anticipate defense challenges in the Arctic for another decade, but Papp said greater access and traffic in the Arctic were already increasing national security risks in a broader sense. "You need assured access," he said, noting that it had been sheer luck that the Coast Guard had had an ice-breaker nearby when a fuel tanker got stuck in the ice near Nome, Alaska about three years ago. At that point, it was the only such U.S. vessel, while Russia had more than 40 ice-breaker ships, Papp said. Papp said it cost the Coast Guard over $120 million to fix the Polar Star ice-breaker so it could remain in service through 2025, but it would cost more to upgrade the Polar Sea, moored in Seattle, since the Coast Guard had raided the ship for parts. New U.S. navigation and communications satellites were also needed since the current systems are optimized for middle latitudes and are unreliable and inaccurate at higher latitudes. Alaska would also need new fiber-optic networks to transfer data as more and more companies ventured north, a deep water port to handle any future crises and potentially additional hangars for servicing Coast Guard and military aircraft. As oil companies prepared to drill in the Arctic, it was critical for oil companies like Royal Dutch Shell and the Coast Guard to test and train for potential oil spills, Papp said, citing the lack of knowledge about how to deal with such an event in the freezing cold Arctic waters.